There is lots of fun to be had at the bookstore for adults and I am not talking about Fifty Shades of Grey. I’m talking about a coloring book. Yes, a coloring book. The Inky Treasures series of coloring books are designed for children. But their complexity of art and grown up images have made this a bestseller among our adult customers. There’s more to do than just color. Creatures and treasures can be found on the pages, and there are hidden objects and symbols to be discovered to complete a puzzle at the end. These books are fun. Silly, old-fashioned fun, and I cannot keep them on shelves. And it’s not just me. Ingram Distributors has almost 13,000 on order for the two books combined. 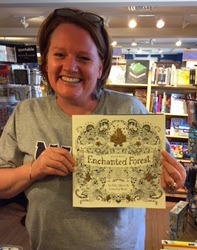 I have to confess I knew nothing of these books, Secret Garden: An Inky Treasure Hunt and Coloring Book or its companion, the newest one in the series, Enchanted Forest: An Inky Quest & Coloring Book. But more customers sure did. Within a week, I had more than six special orders for them. Today, I finally learned about these books from an extremely happy customer. Maureen came in yesterday fresh from the first nice day we’ve had and asked for her special order. She orders often enough that she really couldn’t remember what had come in. I handed the book and she started smiling from ear to ear. “Do you know about this?” I said that I didn’t. “It’s a coloring book for grownups. I can color again!” Her enthusiasm was utterly contagious. Maureen missed coloring with her now teenaged sons. She explained about the joy of colored pencils and just taking some time and filling in a beautiful drawing with the colors of your imagination. She left clutching the book to her chest. And then, I ordered a coloring book for myself. This entry was posted in Uncategorized on April 14, 2015 by Josie Leavitt. For years I’ve harbored the vague hope that I’d be picked up for some minor misdemeanor and held in a solitary cell with some of Ruth Heller’s coloring books and a set of markers. (Charges would, of course, be conveniently dismissed.) I may have to order these new opportunities and see what can be enjoyed outside the bounds of the bookstore, but within the law..
Coloring books for older kids and adults have been around for quite some time. These books are great creative outlets and also great ways to educate while creating art. They are also great tools for rehabilitating and exercising the brain and hand eye coordination. Many of the subjects go beyond decorative designs and explore areas like history and creative literature like tall tales. I’m always a fan of people being creative on some level and coloring books offer this opportunity. 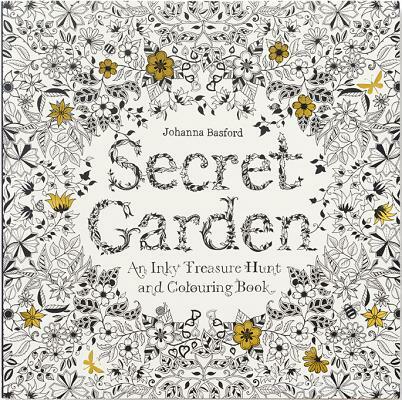 A coworker posted a link to this article internally: http://gizmodo.com/why-millions-of-grownups-are-buying-this-coloring-book-1694045777. Now, with your mention, I may have to actually buy one myself!